This article is the twenty-eighth in the periodic Blue Water Trails series highlighting the floating, fishing and tourism opportunities on Kentucky’s streams and rivers. Study of the Kentucky border in Simpson County reveals a funny-looking half triangle just south of Franklin. A surveying party in the fall of 1780 used a marked beech tree along the West Fork of Drakes Creek as a point of reference, but wandered decidedly off course to the south. Dr. Thomas Walker, commissioned to draw the boundary between the far western sections of North Carolina and Virginia before the creation of Kentucky and Tennessee, discovered the error. The surveyors simply worked back north to the original line rather than correct the mistake. The West Fork of Drakes Creek drains Blackjack Corner and a good portion of Simpson County. It offers excellent fishing for smallmouth, largemouth and rock bass along with populations of bluegill and even some muskellunge. Fisheries biologists for the Kentucky Department of Fish and Wildlife Resources report seeing smallmouth up to 18 inches during population sampling in the creek and believe larger individuals inhabit this water. The Warren County Blueways website at www.trailsrus.com/blueways provides information on floating the streams of the Drakes Creek system. Brown metal markers at the put-in and take-out locations correspond with the map provided on the website as well as the map that accompanies this article. As days shorten and nights lengthen in September, the topwater bite for stream smallmouth bass comes on strong. Bone or chrome-colored cigar-shaped topwater lures designed for the walk-the-dog retrieve excel in September for smallmouth bass. Floating and diving lures such as a Rapala also shine in early fall as do 1/8-ounce black Jitterbugs during low light periods. Three floats showcase the beauty of the upper Highland Rim in Simpson County, two of them manageable and perfect for fishing while the other much longer and suited more toward a straight paddle during the higher flows of spring. The first of the fishing floats begins at the Sadler Ford Road bridge access (also known as Clay Starks Road) and concludes roughly 5 ½ miles downstream at the Woody Atkinson Road bridge access (also known as Barnes School Road). Look for the sign for Berrylicious Orchards on KY 240 for Sadler Ford Road. Be sure to observe the posted signs concerning parking at both of these access spots and respect the posted private property. The first bend to the left (looking downstream) of this float reveals the gorgeous exposed rock and gorge-like setting on the lower sections of West Fork of Drakes Creek. The creek makes several sharp bends in the first bit of this float, perfect places to work a green pumpkin double-tailed skirted grub, commonly called a hula grub, rigged on a 1/8-ounce leadhead. After a hard left bend a little more than a mile into this float, the West Fork flows straight to the north for a stretch. The creek then enters into a series of bends with some exposed rock. This stretch makes the best smallmouth bass habitat on this float. The rocky outside bends should be probed with the double-skirted grub and topwater lures. Anglers should also target the flowing areas just above and below rock bars in this stretch for smallmouth bass. A 2-inch black curly-tailed grub worked in the slack water below these bars draws strikes from rock bass. The roar of commerce moving on I-65 soon surrounds paddlers as the West Fork flows underneath. Just after I-65, the creek bends to the right and soon back to the left. These bends also make good spots to prospect for smallmouth bass. After the last bend to the left, the creek flows over a shallow bar and drops into a long, tranquil hole. This hole makes a good spot to fish a weightless pearl-colored soft plastic jerkbait in the woody cover for largemouth or spotted bass. A medium-diving crankbait in the clown color could draw a savage strike from a muskellunge. These same spots also hold abundant bluegill. At normal flows, the take-out at the low water bridge of Woody Atkinson Road comes into view. This style of bridge, called a slab in some parts of the country, allows water to flow through drainage culverts under the surface of the structure. Paddlers must avoid these culverts at all costs; the best take-out is on the left. The next float begins at the Woody Atkinson Road access and ends about 4 ½ miles downstream at the KY 622 access (Plano Road) in Warren County. The shuttle for this float is to the north, via KY 240. The West Fork bends to the left at the beginning of this float before flowing back to the right and entering a more entrenched stretch with some tan-colored small bluffs. Anglers should work the outside rocky bends for smallmouth bass in this section. The stream is relatively straight before flowing in an “S” shape. The fallen trees in the deeper holes in this stretch hold largemouth and spotted bass. The weightless soft plastic jerkbait works well here. The deep hole formed as the creek flows back to the right against a high bank may hold muskellunge. The creek flows serenely for a good ways before making a series of bends with some gorgeous exposed rock. The 3/16-ounce skirted double-tailed grub worked slowly along the outside bends with current attracts smallmouths. This stretch contains several deeper holes that hold largemouth and spotted bass. After making a long bend to the left, the West Fork makes a hard bend right and the KY 622 Bridge comes into view. The take-out is on the left, immediately downstream of the bridge. Warren County Parks and Recreation provides a small parking area on the north side of this bridge that parallels the road. Do not block private driveways or farm gates while using this access. The next float begins near Franklin at the low water bridge on Ditmore Ford Road and concludes about 10 miles downstream at the Sadler Ford Road access. Paddlers may also launch upstream at the Franklin-Simpson Parks and Recreation Park in Franklin, but this requires an arduous portage around the low water bridge at Ditmore Ford Road. The park does provide wading access to the creek. 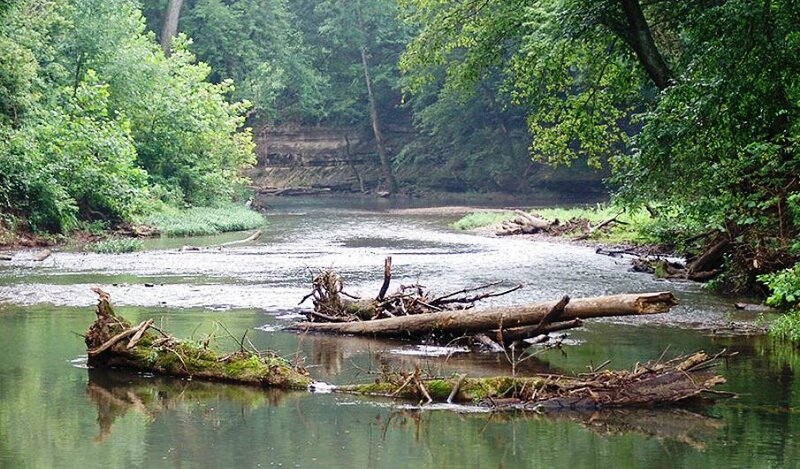 Fisheries personnel with Kentucky Fish and Wildlife recommend this float for spring to early summer when West Fork is flowing considerably higher than fall. They say the best fishing and year-round paddling is from Sadler Ford Road access downstream. Paddlers should plan for considerable dragging and carrying of boats through the many long, shallow stretches found at this time of year on this float. It better suits straight paddling and its length leaves little time in fall for fishing. Paddlers should put in early and plan to take out late. The two bridges at KY 1171 (Blackjack Road) and KY 1434 (Salmons-Blackjack Road) encountered on this float are not public access spots. The West Fork of Drakes Creek is a great fall destination. Paddlers may combine a weekend of floating on the West Fork of Drakes Creek with turf-only racing at Kentucky Downs near Franklin during its September meet. This track boasts the only European-style turf course in the country. Visitors may also enjoy local historic sites such as the Sandford Duncan Inn, a famous stagecoach stop and inn which began providing food and drink to travel-weary guests in the early 1820s. This inn also hosted duelists before their dangerous battles of honor at the nearby Linkumpinch Dueling Grounds, including Sam Houston, the future governor of Texas. Houston severely wounded Gen. William White in a duel in September 1826 here. According to local lore, Duncan is responsible for Blackjack Corner by plying the surveyors with whiskey to convince them to keep his land north of the border, thus creating the unusual jog. Simpson County is also home to the famous Octagon Hall, the only eight-sided house in Kentucky and now a museum. This historic home served as a refuge for Confederate soldiers during the Civil War and is rumored to be haunted as well.